Sleddogsport.info: The number and breed of dogs? Elena Shepeleva: At the moment we got 46 dogs: 1 Rhodesian Ridgeback, 1 Alaskan Husky, others are Siberian husky. 18 show huskies others are sporting line. Elena Shepeleva: SDC Concord for WSA, Snow Dogs for IFSS. Elena Shepeleva: My first start was in 1998 in Moscow on 2 huskies in Russian Championship. Elena Shepeleva: Kanderstag WSA ECh 2009. Elena Shepeleva: Near my house in Korobovo by cart and sled. In Chulkovo by cart and sled, In Troitsk by cart and sled, in Dzerzhinsky by cart. 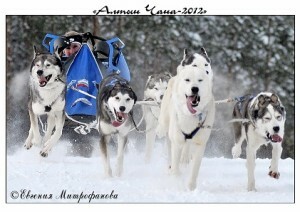 Sleddogsport.info: What do you like best in this sport? 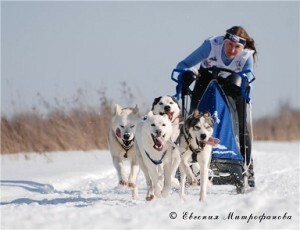 Elena Shepeleva: Cooperation with dogs, emotions from speed, from snow and dogs work, lots of friendly people. Sleddogsport.info: What in this sport`s most annoys you? Sleddogsport.info: What do you think about the division FISTC and WSA? Elena Shepeleva: I trying to do it, but…. Elena Shepeleva: Also I have pet-horse, driving motorcicle, traveling by car, to read. Elena Shepeleva: Folk-Rock, Russian Rock, and lots of others. Nightwish, Gregorians, Lesiem, Linkin Park, Nickelback, Florense and the Mashine, Nautilus Pompilius, Picknick, Fleur. 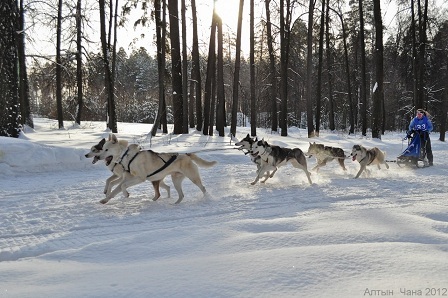 Sleddogsport.info: What do you like best to eat? Sleddogsport.info: You r greatest sporting dream. What do you want to achieve in the future? Elena Shepeleva: To be Olympic champion in B1.